Two months ago I made my first henna mix since going natural in 2011. I heard about henna treatments early on in my natural hair journey and discovered facts about its colouring, conditioning and strengthening properties. However, alongside that information I also read about the process of preparing the henna mixture. There was talk of mixing a seemingly long list of other ingredients with the henna. It sounded daunting… and messy. I couldn’t be bothered with it all so I opted for an easier solution and searched for a premixed henna. The above is a simple recipe you could follow or adapt to suit your needs. You could only use henna and water but I suggest including other ingredients that help your hair attract and retain moisture. Examples include aloe vera, honey, butters and oils. in addition to these, including an ingredient which is acidic will help the dye (Lawsone) in the henna to be released. It’s this dye which binds to the protein in your hair fortifying the hair shaft, conditioning and repairing it from the scalp up.The addition of acidic ingredients also serves to keep the ph low which is more favourable for our hair. Green tea, apple cider vinegar, lemon juice and amla powder are all good choices for acidic ingredients. The amounts used of the said ingredients will depend on the length and thickness of your hair but in short, starting with about 100g of henna is sufficient for shoulder length hair. Mixing the henna wasn’t difficult and the results were very good, better I would say than the LUSH blocks I was using… and for less money. By mixing my own henna I also avoided the grittiness of the LUSH blocks which I thought could be detrimental to the health of my fine strands in the long run. The henna I purchased from Shea Butter Cottage was really well ground and easily mixed into a smooth paste ready for use. Know what you want to use the henna for and consider the state of your hair and its preferences. If your hair is colour treated then research how applying henna on top of your colour will affect your hair and how long the intervals should be between uses. If you have a problem with chronically dry hair then make sure you improve your moisture balance before applying a henna treatment, as you are in affect giving your hair a dose of protein - so your protein/moisture balance will be altered after treating your hair. Be ready to respond to your hair by giving it the extra moisture it may need in the weeks after the treatment. If you come across henna sold as ‘black’, ‘neutral’ or another colour other than reddish-brown then it’s possible that the ‘henna’ could contain other herbs which aren’t actually henna, or worse, harmful metallic salts and chemical dyes. True henna only comes in a red tone. So beware of this, check the ingredients list of the packet and make sure you purchase body art quality henna from a reputable store. Don’t let the so called ‘messiness’ of henna put you off from giving it a try. If henna was white in colour then I don’t think it would be considered to be quite so messy. Henna has been so beneficial to my hair over the last year, I wish I had used it from the beginning of my natural hair journey! - When you mix up your henna aim to achieve a consistency between mashed potato and thick greek yogurt. Aiming for this thickness will reduce the chance of splashes and drips on you and your bathroom. You can also wear an old shirt and place some newspaper or a plastic sheet on the floor for extra protection. - Section your hair before you start applying the henna. 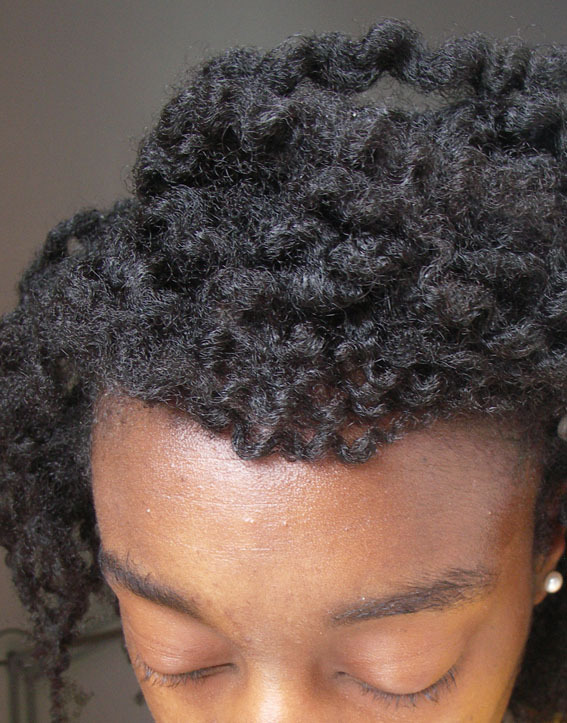 Your hair should be detangled and in 6 loosely twisted sections. Use some crocodile clips to keep your hair in place. - When applying the henna take your time and use an old plastic bowl with a brush applicator (the kind used when applying a relaxer) to easily apply the henna throughout your head. - When you’re done, gather all your hair sections together into one place and wrap your head up with cling film to stop any henna from leaking out. - If you have children then choose a time when they will be occupied for at least 30 mins or if you’re really short of time, apply it in the evening and leave it on overnight ensuring your hair is wrapped with a few layers of cling film, plastic cap and head scarf. Why not give henna a try? This natural herb has fantastic qualities that may just give your hair the boost it needs in the coming year. I've been wanting to try henna on my hair for a while but now I've actually plucked up the courage to give it ago. To learn a little more about henna see curlyNikki's post here. After doing a lot of research on henna I decided that I would love to give it ago for it's strengthening qualities. Because my hair is fine its perhaps more prone to breakage than other naturals who have thicker hair strands so I wanted to try treatments which strengthen the hair shaft naturally. Henna leaves colour deposits on the hair which I don't really mind, as long as it wasn't going to turn it orange! 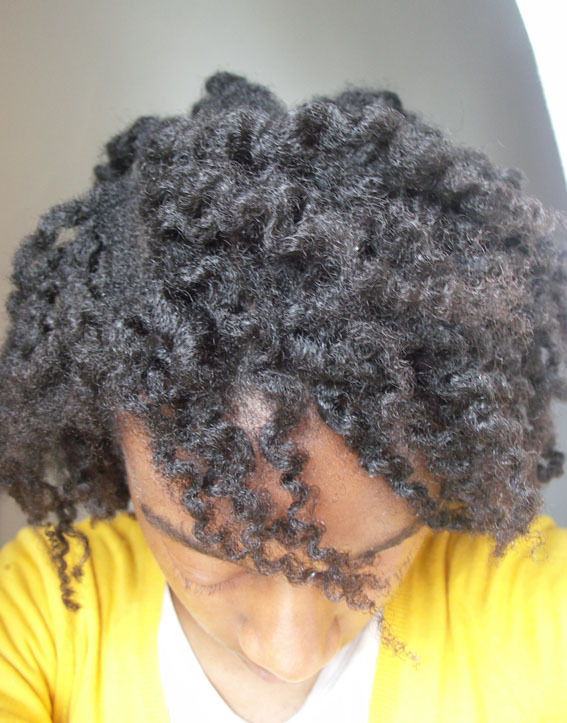 I also read that it can loosen the curl pattern of your hair every time it is applied. 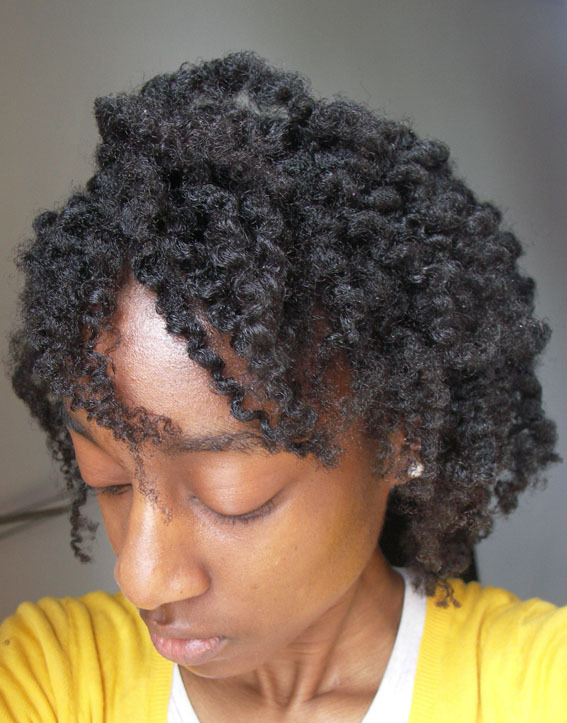 I don't know if this will really happen to my hair as my curl pattern is so tight, but I read that this has been noticed with people who have looser curl patterns (3c, 4a hair types) so I don't think I have too much to worry about. Anyway, onto the process. if you prefer to watch the process please see my youtube video or read on for a summary. I decided to buy Lush Caca marron (£8.25 a block) because I wanted to get the henna from a trusted source. While researching I read a few comments from people who had been scammed when purchasing their henna. They had tried to purchase the Jamila brand henna but instead had been sold fake henna which probably contained harmful substances. Also, some kinds of henna need to be mixed with other ingredients so that the dye can be released. Everyone I read about seemed to do it in a different way so I searched for an easy solution. Lush Costmetics sells henna in blocks which you simply add hot water to and stir up. I also consider Lush to be a trusted brand so I decided to buy my henna from them. I chose the Caca marron because I prefer the darker chestnut tones it is said to give instead of redder tones. The Lush henna also contains some great added ingredients like coco butter and essential oils. I would say that planning is essential for the whole henna process. I would suggest setting aside a day when you're not massively busy. Firstly get all the things you need together and put them in the bathroom e.g. newspapers for the floor, old towels, clips, vasaline and cleaning equipment. Then mix up the henna with hot water and stir it until It reaches a thick yogurt consistency. Section off your hair into 4 or more sections. Apply vasaline to your hairline. Put your gloves on and apply the henna to your hair by gently patting it onto the section you are working with. Be careful not to press and smooth down the henna too hard along your hair. The henna is very gritty and I read that if some of the sharp pieces are pressed down onto the hair too hard there's a possibility of introducing mid shaft splits along your hair strand. This part took me about 30 minutes. Wrap your hair in cling film (optional for extra protection) and put a cap on. I kept the henna on for 6 hours, during this time I went out to the shops and just simply popped a beanie hat on over my plastic cap. I kept the henna on for 6 hours because it was convenient for me and my timetable. I think the pack says you can leave it on for 2-3 hours but I don't think it really matters if you leave it on for longer than the stated time. Be prepared to do a bit of clean up. But don't worry. if you've tried to be careful when applying the henna then the clean up shouldn't be too bad. I suggest cleaning the sink area as soon as you have finished applying the henna to reduce the chances of stains. When washing the henna off do so one section at a time. You can use a conditioner to do this. I used Cantu shea butter conditioner because I had some I needed to use up. It took me 4 washes to really get all the bits and pieces out so make sure you leave yourself enough time. After I washed the henna out, my hair felt great. My curls really popped, especially at the crown area where the curl pattern is more of an 'S' shape. My hair didn't feel hard or dry like many people had reported from their own experiences. I didn't follow up with a conditioning treatment as my hair felt really good. I just applied my curly pudding and stretched my hair as usual. In the morning I styled my hair, it still wasn't dry and hard. Instead it felt really soft and hopefully it had been strengthened by the treatment too. Overall I would recommend giving this product a go to discover whether it works well for you and your hair. You might find the whole process a little too fussy and drawn out, or perhaps you find the benefits to your hair out weigh the process. I have two young children, 4 and under, so I made sure that when I was applying the henna they were occupied with my husband. When I wanted to wash the henna off I did so in the evening when they were in bed. I loved how my hair felt after using it so I'm going to continue to use it, perhaps four more times and see what the effects are. What have your experiences been with henna? Good? bad? or ugly? !